My Second Sugru Fix: Reduce Reuse Recycle Boogie ! – Creative Dynamo Ecotainment! My Second Sugru Fix: Reduce Reuse Recycle Boogie ! When trying to explain Sugru to friends I feel like I fail to do it justice. After one such incident I was inspired to open up my last such sachet and put it to good use. I am always looking for uses for my Sugru and in this instance the fix was right under my bum! What’s more the colour matched which made this a fix made in heaven and worth writing about. I am a solar powered DJ playing dumped vinyl records on discarded equipment. It’s a lot of fun but also a serious statement about our throw away society. This fix is for my Seat/ Toolbox/ Podium which is an essential part of Tip of the Pops Wheelbarrow Disco. I would really suffer without this multi-purpose piece of equipment. If this goes bust I would be unhappily sat on the floor with pockets full of wires, tools, pens, paper and props. Sugru will keep me smiling whilst partying with Tip of the Pops for another season or more. As you can see from the photos the seat is well used, the handle randomly falls off due to wear and tear and the lid does not shut properly (one clip’s already been lost). When I looked under the lid I also found stress fractures from the times when I’ve actually stood on my seat and danced. The great thing about Sugru is that I always end-up using less than what’s in the pack which meant I had plenty left-over to reinforce some of the stress fractures I found. 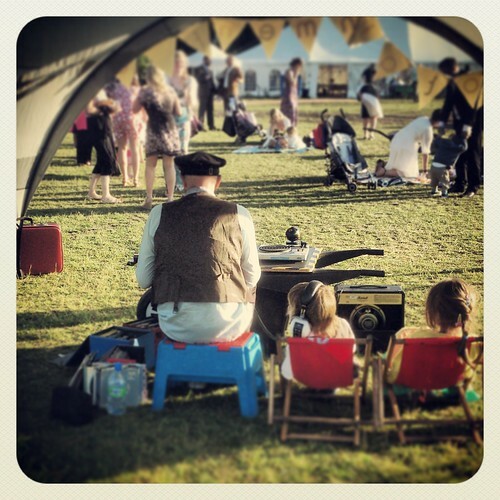 Tip of the Pops is part of Creative Dynamo Ecotainment a not-for-profit social enterprise in Dorset, UK. ← Food Waste Rap for Primary School Children Think.Eat.Save reduce your foodprint!